I'm not usually a big fantasy reader, but this book is commendable and ought to be on your list if you're at all interested in the genre. Many people seem to bail out after only a few chapters; don't do that. Give Novik the opportunity to spin her tale for you - it takes about 50-60 pages to really get rolling. From there, it builds to a strong ending. In fact, I'd say even if you don't like fantasy very much, this novel merits at least an attempt. This isn't a fantasy story built from worn-out tropes. While many familiar elements make their way into the narrative, Novik reworks them to give them value. I felt the familiar worn edges of strong themes from centuries of good stories; I saw plenty of familiar fantasy elements. But I also enjoyed the rich and thick development of new meanings for what could have been tired and boring - the girl who learns to control her magic, the aloof wizard, the budding romance, the courtly drama, the forbidding enchanted wood. Novik turns these tropes sideways so they work to her advantage. She turns the story too, not in a "cheap shot" yank-you-around kind of way, but artfully, shaping the reader's journey through what seems like a familiar landscape to find what's actually something new and rewarding. So yeah. It's a solid book. It's up for a Hugo Award. That's not a fluke. I've found myself thinking about this story even after I read the final pages, and I think it's because Novik understands that good stories aren't created by the trappings of the setting or by cheap plot devices; they're built from the backbone of realistic characters grappling with credible problems, clothed in fluid prose. I don't think this will be my top Hugo pick, but it'll fall above the "no award" line for sure. 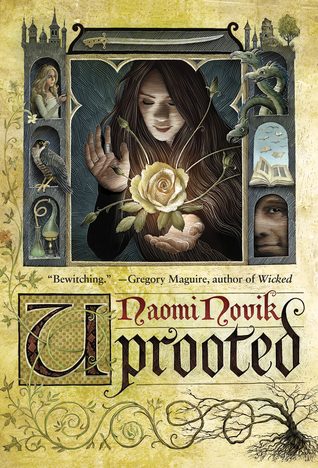 Sign into Goodreads to see if any of your friends have read Uprooted. 65.75% "Reading the Hugo nominees. If you like fantasy stories, this one is actually quite good."